Speaking on a panel called "Women. Meditation. Stress." hosted by the David Lynch Foundation, Lena Dunham recalled her OCD diagnosis at age 9, and how meditation helps her stay calm and focused. "I've actually been meditating since I was nine. I've been practicing TM [Transcendental Meditation] since I was nine," she shared on stage. "My mother meditates, my grandmother meditates and my great-grandmother meditated. 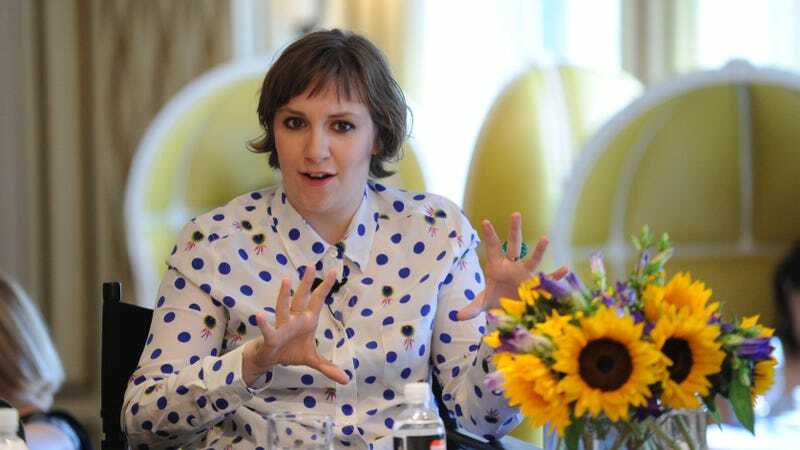 That might make you think I'm part of like a grand hippie tradition, but these are actually all just neurotic Jewish women who need TM more than anyone," Dunham joked. "I have to tell you, it's pretty charming to see a very well-dressed anxious Jewish woman take a moment at her country club because she needs to meditate." "When I was around nine, I was diagnosed with obsessive compulsive disorder," the actress and writer explained. "I feel forever grateful that instead of assaulting me with a barrage of medications my mother decided it was time for me to learn to meditate . . . Although when you're nine you have trouble articulating the sort of internal shifts you feel, I know that it made an incredible difference. It made it possible for me to understand what I was going through, and to process what I was going through and to calm down." Robin Thicke would like you to know that he's the real victim of Miley Cyrus's addiction to twerkahol. “You didn’t think of it as sexual?” asks Oprah of the V.M.A. performance. According to "a spy," Madonna wouldn't stop texting during the New York Film Fest premiere of 12 Years a Slave. ...as the movie began, “a blonde in black lace gloves wouldn’t stop texting,” seated in a row with Jason Ritter, J. Alexander and Michael K. Williams. But it seems that the Material Girl was a fan of the film. Another spy said that as the credits rolled and she tried to swiftly make a dash from the theater, Madonna heard director McQueen’s voice as he began a Q&A. She was overheard saying, “‘I want to hear Steve speak,’ then rushed back in for the Q&A,” the source said.